I am a very strong advocate of LinkedIn and the business network it brings. It is a great tool to effectively bring your networks closer with which only works upon how you use this platform. I am a relatively early adopter of this service. I have recognized that it is something that of use to me and my contacts beyond rolodex and business cards. I could get to know more about them professionally and could connect, combine, partner, collaborate and utilize the potential relationships that evolve around different sets of experiences and talents. I’d have some chance to know the soul behind the CV and eventually figure out how to make the connection work in so many ways. This platform helped me to work for people around the world, along with their different cultures, challenges and learnings to tackle within the expectations of what I could deliver for the clients as a consultant. LinkedIn helped to supply 85% of my income for 3 years of being on my own, exploring my career and expanding my knowledge within the industries that I could contribute in along my network, their recommendations, word-of-mouth and introductions. 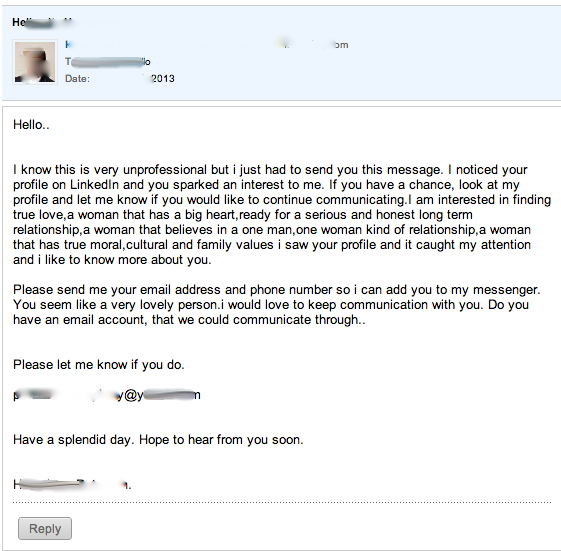 This is a conscious act the way LinkedIn is being used. It is professional. You may have family or friends within your network but keep the conversations and interactions here formal, according to business terms. Transparency. You are what you write. Everyone has different ways to narrate, expose, cite, list their experiences and accomplishments. Just make sure that you have an objective in mind on what you write. Be respectful. Now, this is where the point of this post really is. A sizable amount of users just do not have any idea on how they present themselves on this platform. It is just the same as how you present yourself in F2F networking or a job interview. – Be mindful on how you add people to your network. Be genuine. Write something beyond the template “I’d like to add you to my professional network.” WHY are you adding someone? Who are you? Why does it make sense to be connected? If you can’t answer these, then don’t bother adding. What for? Never take it for granted. This shows respect and value that are impressions of a ‘legit’ fellow. – Be honest if you’re really looking for a job. Stop the BS. This is one of the capacity of the platform so stop speculating that people ‘use’ people to get something. That says a lot if you’re a cynic rather than utilizing the platform for what it really is. – This is not a dating site. Go elsewhere to do this. – Don’t trust me – if you don’t know me. Do not use the “Since you’re the person I trust…” card negligently on anyone if you’re strangers to each other. It says a lot about your EQ, and maybe IQ. Most likely that you won’t get the job if you do not have spatial and social awareness, even it’s virtual. – Get (and suggest) your facts right. Do not add someone and reveal that they’re your colleague from their certain company when you never met nor never worked together. Another one is that if you’ve not done business together, then you cannot declare that. Who are you trying to convince? On the other hand, it could also be our faults. We tend to carelessly accept invitations without sharing knowledge. It may come out as pompous for one, but we have some subtle ways not to tolerate, or educate our networks. We all have the responsibility to sanitize our own environments. This entry was posted in Random Biz, Trends and tagged business, Business networking, Keith Ferrazzi, LinkedIn, professionalism, Social network. Bookmark the permalink.